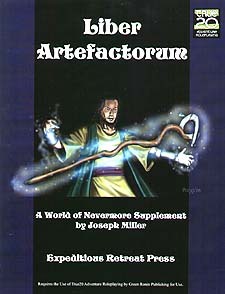 Liber Artefactorum also introduces specific rules for creating supernatural items in the world of Nevermore. Nevermore is an every-changing world where reason fades into myth and imagination. Featured in Green Ronin's True20 Worlds of Adventure, it offers a plethora of possible and even improbable adventures for those who traverse its strange domains. Nevermore amplifies and accentuates, twists and skews, it is a place where nothing remains the same for long and all who walk its lands, fey or mortal alike, are changed forever.